NEVER SUCH INNOCENCE is the acclaimed narrative recital of words and music from the First World War by Christopher Kent (actor) and Gamal Khamis (piano), first performed during the Somme 100 commemorations in 2016 and now appearing in theatres, concert venues and festivals throughout the UK. 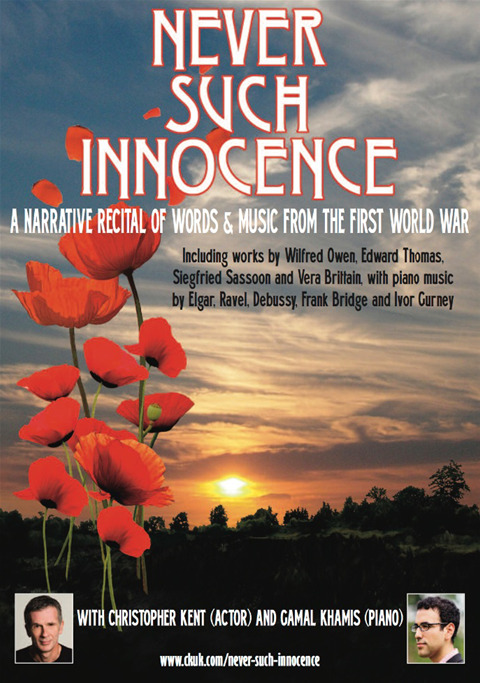 One hundred years after the devastating events of 1914-18, NEVER SUCH INNOCENCE looks back at the writing and music that emerged from the period, juxtaposing the words of writers such as Wilfred Owen, Edward Thomas, Siegfried Sassoon and Vera Brittain with piano music by composers including Elgar, Ravel, Debussy, Schoenberg, and Ivor Gurney. In a moving and thought-provoking sequence, it also traces the individual story of nineteen-year-old conscript Private Percy O’Key through his real-life letters and diaries. It is a compelling journey from innocence to loss, told with unflinching clarity and compassion. "The most amazing evening... one of the most moving and thought-provoking events I have ever attended." “A spell-binding evening. So compelling to watch and listen to… I don't think there was a dry eye in the house."